Performing 80 to 90 concerts in Dresden each year, the Dresden Philharmonic is a vital institution in the cultural life of the city. At the same time, the Dresden Philharmonic also acts as an invaluable music ambassador for Saxony and the city of Dresden abroad. The orchestra has undertaken successful international tours of Europe, China, Japan, Israel, South America and the United States. The Dresden Philharmonic can trace its origins to the formal opening of the first concert hall in Dresden on November 29, 1870. That event marked an important transition in the city’s musical life, as concerts for the entertainment of the aristocracy gave way to concerts performed for the enjoyment of the general public. Starting in 1885, the “Gewerbehausorchester”, as it was then known, gave a full season of symphonic concerts in Dresden, earning the ensemble the name “Dresden Philharmonic Orchestra” in 1915. Well known composers including Brahms, Tchaikovsky, Dvorák and Strauss have conducted the orchestra in performances of their own works. 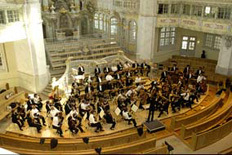 Music Directors Paul van Kempen and Carl Schuricht conducted the Dresden Philharmonic starting in 1934. The tenure of van Kempen is particularly noteworthy for establishing the Dresden Philharmonic’s reputation internationally, attracting such renowned guest conductors as Hermann Abendroth, Eduard van Beinum, Fritz Busch, Eugen Jochum, Joseph Keilberth, Erich Kleiber, Hans Knappertsbusch, Franz Konwitschny and Arthur Nikisch. Since 1945 Heinz Bongartz, Kurt Masur, Günther Herbig, Herbert Kegel, Jörg-Peter Weigle and Michel Plasson have served in the same capacity with numerous recordings documenting their collaboration with the orchestra. Marek Janowski served as Principal Conductor and Artistic Director of the Dresden Philharmonic from 2001 to 2003. In 2003 Rafael Frühbeck de Burgos was appointed Principal Guest Conductor of the Dresden Philharmonic and the following year was named the orchestra’s Principal Conductor and Artistic Director. Kurt Masur is the Dresden Philharmonic's Laureate Conductor.